More and more people were beginning to cross the border from Syria to Turkey in search of refuge. People were not only looking for shelter and safety, but for jobs: This rapid increase in demand did not match the supply of jobs in Turkey. “I had no experience, so I couldn’t just get any job. My migraines began increasing, I couldn’t eat, I couldn’t sleep, I was in severe depression, and I couldn’t admit it to anyone. It just didn’t stop, you know?” She even stopped taking her medication. “Who takes medication for two years? !” she asks incredulously. It took time to pass, but slowly it did. “I began working on a campaign against ISIS. That, however, didn’t last too long because a member of the campaign was found slaughtered in his own apartment.” This is when the German government reached out with an offer of asylum. 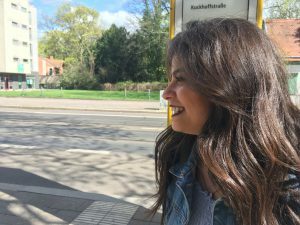 Wafa came to Germany at the end of March 2016. Her older sister had been offered a spot in Bard College in Annandale, so she decided to apply to BCB. “I was terrified. I didn’t want to leave my mother and younger sister alone, but I couldn’t go back because of the complications that ISIS was creating.” Compelled to leave, she decided to focus on her education. It wasn’t an easy start at all, though. After being an active participant in a huge revolution and living a good chunk of her life either protesting or on the run, suddenly being forced to settle down in a place wasn’t at all straightforward. “I hadn’t gone to college in six years and was much older than everyone else. I felt like a Pokemon!” she laughs. Her laughter slowly dies down and she says earnestly, “but it was very difficult. Some of the kids would laugh at me for pronouncing words differently.” She bites her lip, visibly embarrassed by this. “I would go back to my room and cry for hours. I wanted to be fighting in Syria, but instead I was here. I felt completely alienated. It still takes me thirty minutes to wake up every morning because I have to convince myself that I can get through the day.” She reaches up to touch her hair, and carefully studies the ends of it as though trying to distract herself. “Studying seems like such a luxury compared to what is happening in Syria,” she whispers. “Everyone I know is either dead or arrested, and I’m supposed to be fighting there with them. But I can’t anymore. I’m supposed to be fighting, but I can’t. Everything seems really useless at this point.” Her posture has grown limp, and she fidgets with a napkin absentmindedly. The Syria we know today is in ruins. But, oh, how people have fought for it! Even today, Wafa wishes she were back in her country, fighting for it with every breath, but she knows that’s not where she needs to be right now. “Can I tell you something, Tanya?” she leans towards me. “The Revolution didn’t just change my life. It recreated it. I have lost my friends, my family, my life, and my country. But I have won myself.” And, just like that, Wafa Mustafa has conquered the world. Wow! Thank you Wafa and Tanya for sharing this! Thanks for sharing this Wafa! This is such an inspiring story. My heart goes out to you.